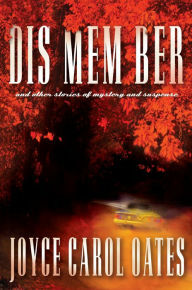 Dis Mem Ber by Joyce Carol Oates is a highly recommended collection of seven dark, carefully crafted short stories. Dis mem ber: Eleven year-old Jill is captivated but a little frightened of Rowan Billiet, an older relative. The Crawl Space: A widow keeps driving by the house she lived in for over two decades. Heartbreak: The rivalry between two sisters intensifies when an attractive male step-cousin visits. The Drowned Girl: A university student becomes increasingly obsessed with the drowning of another girl. The Situations: A father cruelly shows his children that he is the one in charge. Great Blue Heron: A recent widow recalls watching a Great Blue Heron with her husband and begins to identify with the bird. Welcome to Friendly Skies! : "Welcome aboard our North American Airways Boeing 878 Classic Aircraft! This is North American Airways Flight 443 to Amchitka, Alaska - Birdwatchers and Environmental Activists Special!" All of the writing is superb in this collection of stories published in 2016. While I tentatively agree that there could have been more stories added to this collection, I liked the theme these stories presented, with the last story being an exception. Each of the other six stories had a psychologically vulnerable female protagonist. Each of the women (or girls) had an obsession that would result in some unexpected action, or is the result of a precarious situation. They are all in some kind of danger. The last story adds a comedic touch that also takes a dark turn. Disclosure: My review copy was courtesy of The Mysterious Press.